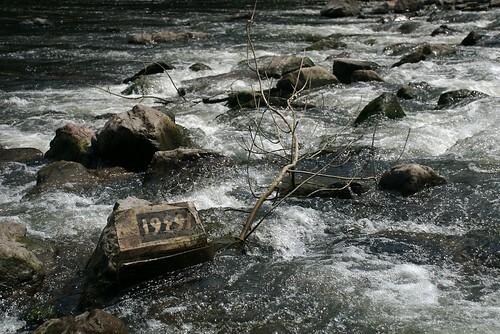 Posted by Stuart Herbert on June 9th, 2007 in Hawthorn and Upper Boat, Merthyr Road, Modern, Photos, River Taff. Whilst exploring the banks of the River Taff at Hawthorn, near Upper Boat, I spotted this soggy piece of cardboard clinging onto a rock in the river for dear life. I love the colour of this shot, and the energy injected into the water by the little weir just out of frame on the right. After all the black and white shots I’ve been posting these last few weeks, it’s almost a relief to come up with a stunning colour shot for a change! Whilst I was there, I took the individual frames that I’ll need to make a panoramic shot of the River Taff. At some point, I’ll get the shots stitched together and uploaded to Flickr as part of a new ‘Panoramic Shots’ series for my Merthyr Road project.